High speed print output and reliable functionality make the bizhub® 751 network printer copier a great choice for any office environment. 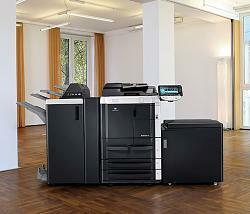 The bizhub 751 prints, copies, scans and faxes at speeds up to 75 ppm. This high volume business multifunction printer allows your business the flexibility it needs with reliability you can trust.